Written and produced by award-winning film-maker Mark Cousins, the massive 15 part series provides a worldwide perspective on the greatest movies ever made through the lens of cinematic innovation. When long-time client Turner Classic Movies called to say they needed to announce the of STORY OF FILM premier to the press in a memorable way, (but on a limited production budget) we took that as a challenge. How to do a modest press brochure that would get the attention of the jaded, media saturated entertainment press? After researching the voluminous content (full schedule with descriptive copy), the photo assets, and even the press sheet size options that were within the budget, we proposed an economical size and number of pages that both accommodated the content and utilized the press sheet with little waste. But how to make it memorable and engage people's imagination? Most times (but not always) the most appropriate creative solutions are hidden within the projects themselves. Such was the case with the Story of Film. 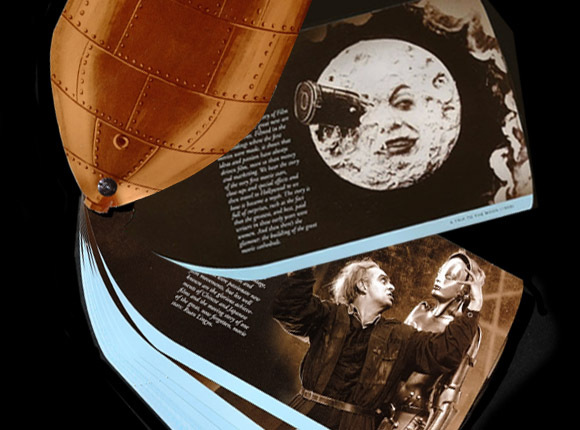 The very first installment of the series highlighted Georges Méliès A Trip to the Moon (1902), which whimsically chronicle's man's first rocket voyage to the moon, as imagined by Georges Méliès. A ROCKET SHIP—what a perfect metaphor for the fantastic journey through the history of world cinema Cousins would be taking viewers on. The single die cut didn't add much expense to the job, but gave the brochure the elements of surprise and drama it needed by making it into a dimensional version of Méliès rocket. A grommet at the nose allowed the brochure to function in a fan deck configuration or a traditional side open unit. A metallic copper touch plate and gloss varnish added the desired sheen to the rocket's exterior. 1.) Make "Every project can be improved, regardless of budget" your mantra. 2.) Thoughtfully research all project components, including print production parameters. 4.) Amplify inherent thematic details to great effect. Though many projects have tight budgets, thoughtful research and informed imagination can circumvent most project constraints. Blah, Blah, Blah. In any event, the final mailer was indeed noticed and very well-received by the press.